Welcome to my very first standardized round of pump noise tests in my continued pursuit of silence (The primary reason I water-cool). This round will be much more controlled with an emphasis on consistency between pump tests. Anything with the pump noise Round 1 will have the same test conditions. Pump noise is normally not a concern for folks with higher speed fans or for installs where the pump is allowed to float freely avoiding vibration transfer. However, solid mounts and/or when users begin dipping below the 1000 RPM level are conditions where pump noise can become the primary noise annoyance. This testing effort is looking at a variety of DDC/D5 series pumps in various flavors and tops measure dbA relatively to flow rate on a low restriction loop. I want to give a huge thanks to my many sponsors. Tim at Koolance.com, Gabe at swiftech.com, bmaverick, and XSPC.biz have all sponsored in some way. Without their generosity this test would not have been possible. Tim from Koolance.com sponsored most of the items in this test including the pump controllers used on voltage regulated pumps. Thanks!!! This round will use a low restriction CPU block only type loop that includes the Danger Den MC-TDX, XSPC RS120 radiator, King Instruments Flow meter, 1/2″ tubing, and a custom 3″ ABS reservoir with 5/8″ fittings. The loop also contains some very low restriction brass globe valves for easier swapping between pumps. I chose a low restriction loop for this round so I could get a greater number of data points. I may later attempt the same for a more restrictive loop although you could cross correlate with RPM values to PQ pump curves if desired as well. Some noise is actually generated at the restriction points (blocks) as well, but this will be a good relative test between pumps. I am also testing in two decoupling scenarios. The first is a near ideal soft foam free floating type test, the second is direct metal contact. This gives you sort of a worst/best range of noise. In my earlier testing I found that thinner foam neoprene would fall somewhere in the middle. Other options such as rubber washers/grommets would also fall in between and likely a bit more toward the worst case condition. This best/worst case should give you a sense of possible noise range which is fairly dramatic in most instances. This will also likely emphasize the importance behind decoupling pumps. For relative scale, I’m including approximate noise level tests from my Gentle Typhoon fan on the left from my fan/radiator round 6 based testing here. It was tested at roughly the same distance so I thought it would give some sense of scale to the charts. This is the old model DDC-1 pump rated at 10 w and manufactured in 2003. I think noise level is subjectively higher than average due to a buzz type noise present, but the pump is fairly consistent with very little issue with harmonic spikes even without decoupling. Fully decoupled at 12V it measures roughly the same noise level as a GT-15 at around 1400RPM. Noise scales well with voltage and at lower volts is approaching the 940RPM fan mark. A good performer for it’s age, but not quite as silent as the newer models. This is the latest PMP-400 pump (18 watt) flavor with a nice thick/heavy acetal constructed top from Koolance. Being acetal and extra thick, this top will likely provide some improvement to the thin and hard factory top material. The pump/top combo does very well when completely decoupled. Even at the extremely strong 12+V mark it’s just a hair more noise than a GT15 at around 1,000 RPM, that’s excellent! You should however noticed there are two harmonic bumps that may or may not be associated with the simulated test rig. The metal contact test however was all over the place with harmonics causing increased noise over the decoupled test from 3 dbA to 15 dbA. This pump & top combo really likes to be decoupled completely if possible, the trick is likely some sort of lift or UN bracket system that will allow cooling and vibration decoupling. This is the new PWM “Smart Pump” by Swiftech. One obvious difference is the much larger operating range over voltage control of similar non PWM pumps. Decoupled the Koolance PMP-450 with Koolance COV-RP450 top is the top performer, only hitting around 33 dbA at full speed, very good! However, similar to the other pumps when not decoupled, the noise levels climb significantly as RPMs increase creating up to 13dbA more noise than the fully decoupled test. This is a second sample pump I had hand and initially decided to test it simply because I still had the factory top on it. My intent was to compare stock top vs aftermarket top, but it turns out I also found some significant sample variance over the first sample. This pumps had some rather pronounced spikes in noise level in a few places. Overall this pump sample did good at middle speeds, but had higher than average noise levels at slow and high which I suspect is an impeller that’s slightly out of balance. Sample variance is obviously a big factor in results so far and is going to make solid conclusions difficult with the low sample quantity being tested. The new king of power on the test bench…running with the factory top which it seems to like the best. The Koolance PMP-450S strong did well, particularly under 14 V with the exception of a blip at 3800 RPM. Very good pump for noise and power. I’ve had this pump for a while, these are the last generation Laing DDC 3.2 series which is being replaced by the DDC 3.25 model. This one also has the base “Feet” and a solid blue impeller. This pump did very well and similar to the Koolance DDC 3.25 and only measuring about 1 dbA (less than perceivable noise difference) at full speed. The thicker Koolance acetal top again seems to help reduce noise levels of the DDC series pumps. It keeps noise at similar levels to an extremely silent GT fan at 1000RPM which is very good when decoupled. Loosing the foam decoupler however reveals a similar erratic and harmonic variable results up to 9 dbA higher than the decoupled test. I’m starting to sound like a broken record here, but decoupling is everything when it comes to pump noise reduction. First, lets look at the “Best Case” scenario where the pump is completely floating freely on a thick piece of foam. Note, DDC series pumps should have a stand to allow base heat dissipation. At the 2.3 GPM mark there are many pumps within about a 2dbA (not perceptible) grouping. The Koolance PMP-450 with COV-RP450 top having a very slight (and perhaps testing error) edge in the charts. The Koolance PMP-400 + COV-RP400, Swiftech MCP-35X, and Koolance PMP-450S are all similarly good here as well. The PMP-450 sample 2 for some reason (suspect sample variance/impeller balance), was slightly higher. The DDC-1 was also a bit more noisy. All of the pumps were of good noise level though, and generally when decoupled were producing under the GT-15 noise level at around 1500 RPM. If you had 10 each 40 dbA fans running in the background that total is 50 dbA, so it doesn’t take a whole bunch of fan noise to quickly mask pump noise “WHEN” the pump is properly decoupled. So…what happens when you have a worst case mount, direct metal to pump contact…. All bets are off….There is really no consistency other than the general lack of consistency and general rise in noise level. There are some things to learn here though, the bumps and dips are scattered throughout which means the vibration frequency and speed can be potentially “Tuned” to hit a low point. If you have a solid mounted or less than desirable pump mount that is causing noise problems, you should seriously consider turning it down/up to see if you can find a low point in the noise curve. Each case and each installation will likely have a unique harmonic noise/rpm profile/pattern, you just need to find the right pump speed to fall on the dips or low points. Pump decoupling has HUGE benefits, up to 15 dbA lower noise levels than pumps without decoupling. Pumps without decoupling are erratic in noise with massive peaks and valleys in noise level throughout the RPM range. Thick Acetal pump tops may provide some benefit to reduction in noise levels over thin factory pump tops. Pump sample variance does also affect noise levels, this may be due to how balanced the impeller is. Luck of the draw. PWM pumps such as the Swiftech MCP-35X provide much more control and RPM range than voltage control. They also provide the ability to dynamically increase decrease pump speed on thermal needs. In general, all of these pumps are extremely silent pumps when decoupled. Most general users with fans over 1000 RPM would typically have a hard time hearing these pumps at all in a normal fan noise masking environment. Critical noise folks using ultra slow speed fans should put extra emphasis into pump decoupling methods and undervolting or reducing pump speeds. Bottom line, if you want an extremely quiet pump, work on completely decoupling it from your case and consider tuning speed to seek the low points along the noise profile. I would also highly recommend using pumps with PWM or fan controllers with thermal throttling capabilities to dial these pumps up and down with load. Dynamic pump speed reduction setups allow for both ultra silence AND peak power when needed. Welcome to a pump decoupling noise comparison test. This test will focus on consistency using just one pump, the Swiftech MCP-35X and compare a direct metal contact (no decoupling), the factory neoprene pad, and a chunk of egg-crate. I was also experimenting with microphone and sound level meter setup because I wasn’t very happy with my previous video results. It seems having the microphone on the test bench was artificially introducing some vibration type noise into the audio recording and possibly into the sound level meter as well. This time around I docked my Zoom H1 on top of my Canon T2i which is sitting on a tripod a couple of feet away. I also place the sound level meter on some cushion to also decouple the sound meter from vibration. I’m starting to notice that while fans generally have very little vibration, pumps obviously do to the point where the instruments can be affected by those vibrations if instrumental decoupling isn’t done as well. Also doing a little work in YMEC software to take a more detailed look at frequency response. 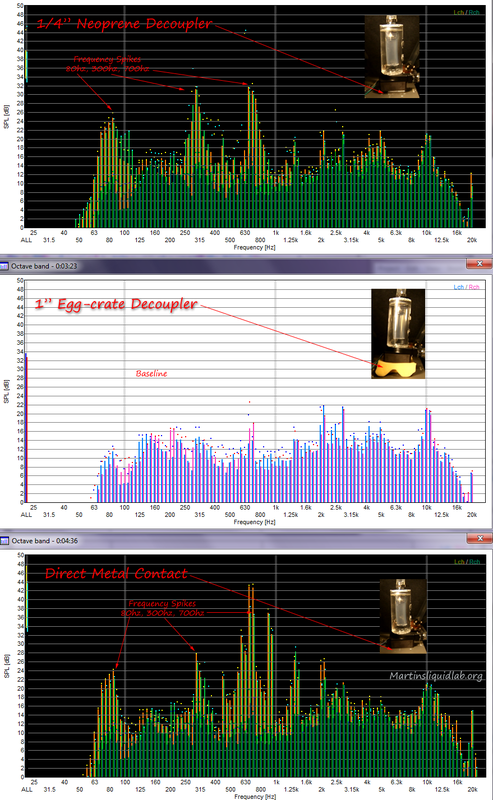 Here are the three scenarios with the egg-crate decoupler as the baseline in the middle overlayed each of the other two so you can see the frequency spike differences. While the neoprene pad helps, it’s not nearly as good as the thicker softer egg-crate foam. The downside is that any sort of foam like this will trap heat, but this is just comparing some decoupling scenarios. Decoupling AND cooling the pump base at the same time is a challenge. I have heard of some people suspending pumps by tubing alone. Here is that frequency response comparison at 100% PWM. Zoom H1 microphone is approximately 2′ away mounted to camera on separate tripod. This does seem to avoid any vibration induced noise on the microphone itself. Of coarse this is tested in extreme silence to try and sort out any fine details. Even with the microphone place a couple feet away, using software A-weighting I’m seeing upwards of 6dbA improvement using the neoprene pad over direct metal contact, and around a 12dbA improvement using the egg-crate as a decoupler. This is fairly substantial and easily perceived difference in this silent testing environment. No doubt that decoupling makes a noteworthy improvement to pump noise in silent environments. And the video recording, zoom to the very end for just the 100% PWM sound clip comparison. The pump used in this experiment was sponsored by Gabe from Swiftech.com, thanks!